Trade has existed throughout much of human history - there is even evidence of product exchange during the stone age. And that’s, believe it or not, when “Flintstones” show took place. Amazing, isn’t it? Coming a long way through the ages, we’re now taking advantage of online retail - a convenient way to buy and sell whenever or wherever you like. To consumers’ minds, however, purchasing online has always been accompanied by some degree of risks - well-grounded or not so much. The spread of phishing scams, malware, and low service websites has resulted in customers being often over-conscious, suspicious and incredulous. Obviously, every time a watchful shopper suspects your store of being not trustworthy enough, you’re losing a sale. Repeatedly. There are no excuses of having a website design that looks like a mess of a child’s drawing and an interface of Windows 95 (unless it is intended to be an avant-garde masterpiece). Like an exterior of a cafe, storefront design can either attract customers to “sip a cup of coffee”, or push them away. For a customer, considering there are hundreds of beautiful themes and templates available, the reasons behind a poor website design are - either you don’t care, either your store is a fake. Regardless what he or she concludes, this won’t add any credibility to your online retailer. Showing shoppers you’re website is fraud-free can be easy when simply using secure badges - the ones you often see in the bottom of various websites. Nearly 75% of customers agree that trust logos affect their sense of confidence in a particular website. So let your customers know they’re safe by simply displaying familiar SSL certificate symbol, PayPal verified or McAfee Secure (or all of them at once). Obviously, a vivid and successful business should always actively improve, expand and freshen up - and when it is, customers may know the store can be trusted. Firstly, ensure that contact and shipping information is valid. Then, review product information. Spend some time and go through product descriptions, as well as old blog posts (if there are any) no to confuse or mislead your visitors. Short blog posts on store news, improvements, and stock replenishment will also do a good job. Social media activity is either an effective way to engage with your audience. It doesn’t take a lot of time to update your Twitter or Instagram, but it clearly shows customers you’re transparent, ready to contact and take care of their orders. If there is something more irritating than trying to contact a business and not being able to, let us know. That’s suspicious too: if a business is trustworthy, why would it make impossible to get in touch? A simple contact form with a physical address and an email can do real wonders. The address will convince customers you’re not just an internet ghost and actually located somewhere, and email… Well, how can you not provide an email? If you’re capable of taking care of customer requests promptly (or delegating them to someone else), consider adding to the list an online chat and a toll-free telephone line. These are the most effective ways of establishing a quick connection between a customer and business, and the best proofs of your credibility. Normally, it takes only a few seconds for customers to determine whether they want to stay or leave a website. 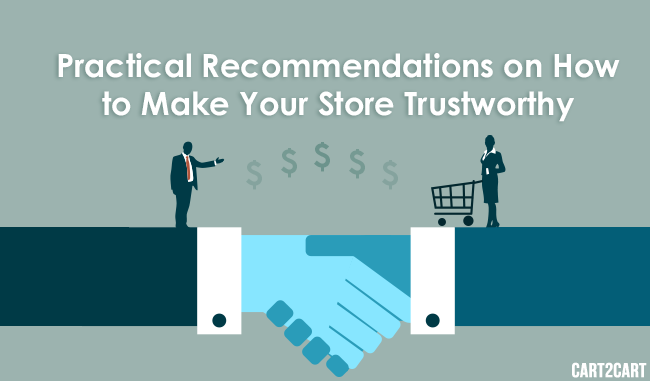 And while there are many factors that influence purchase decisions, giving any reason to suspect your store of being untrustworthy is a straight way of losing a sufficient amount of revenue. So take a deep breath, and make your website look credible by implementing the tips above!